"Przemysław Jasielski. From the art of the Anthropocene to post-anthropocentricity"
Faced with this prospect, we must not wonder that the Polish philosopher Ewa Bińczyk in her Epoka człowieka [The Human Age] reflects on the “malaise of the Anthropocene”: we have full knowledge of the consequences of humans’ impact on the environment, yet we are unable to take actions necessary to duck the bullet. Quite the opposite, we continue to act in ways that only make things worse. How to shake off the malaise of the Anthropocene? How to shirk the idiocy of visions where the silver bullet of technology saves the day? More than that, how to evade the despair and apathy of those helpless in the face of a looming apocalypse? We need to wield the ultimate weapon: our imagination. The imagination that the active participants of the May 1968 events in Paris wanted to take control. The imagination that was glorified in the motto of the Forum for the Future of Culture 2017: Freedom, Equality, Imagination. And yet it does not help to simply evoke imagination unless we know how to use it. Enter Przemysław Jasielski, an artist with a unique imagination which has evolved in the course of his artistic development by shifting from the art of the Anthropocene to post-anthropocentricity. More than a decade ago I came across his “control unit” series of works: “Earthquake Control Unit,” “Earth Rotation Speed Control Unit,” and “Global Warming Control Unit.” They have become canonical examples of the art of the Anthropocene and an intriguing take on the relationship between humans and the geoecosystem. That was a decade ago. The artist doesn’t stop evolving. 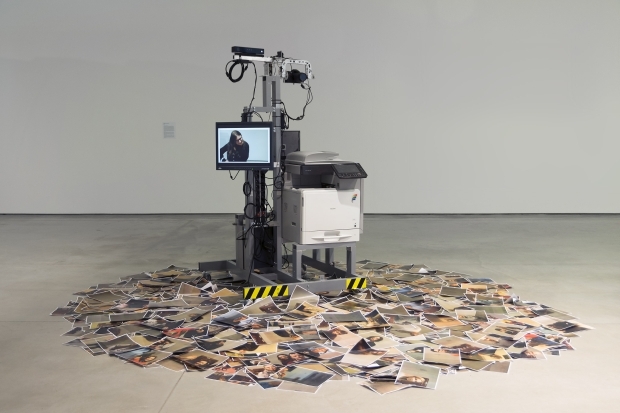 His new projects speak to the intimate relationship between humans and technology. They unmask the technological system, originally described by Karl Marx, where humans are no longer masters but parts of a system which unfolds according to its own logic. 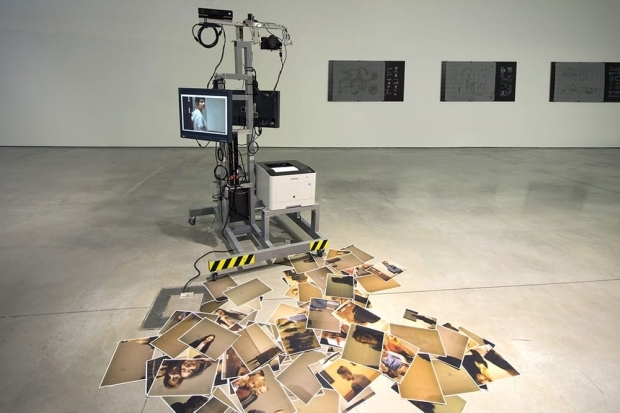 This opens up a post-humanist and post-anthropocentrist perspective, perfectly embodied in the installation “Photo Robotoid.” A machine which takes automatic photos has to co-operate with humans; after all, it is their photos that it takes. But the machine does so according to its own designs, which shows that its autonomy is not necessarily perfection as understood by humans (such as faithful representation of the model); instead, the machine’s autonomy may engender a different understanding of the meaning of its actions, and thus produce photographs of original yet obscure aesthetics. The photos themselves seem perhaps less interesting. Typically, those interacting with the Photo Robotoid often leave them behind, perhaps unhappy with the outcome. It turns out that what really matters is the interaction, the attempt to engage the machine in a dialogue, to “convince” it or to outsmart it so it would yield to the will and expectations of us humans. But there is no chance of that. The outcome is beyond anyone’s control. At the Art Line conference, I said: “The Anthropocene requires a leap of the imagination. It requires an apocalyptic imagination. An imagination worthy of the time and age when all bridges to the Arcadian world of the past have been burnt and humans are both the master of and hostage to Nature. ‘Progress and catastrophe are the opposite faces of the same coin,” said Hannah Arendt. The French philosopher Jean-Pierre Dupuy elaborates on her credo to develop a philosophy of enlightened catastrophism, which stipulates that what is impossible is certain. What makes impossible possible is thinking it.” And representing it, I should add to encourage you to interact with Przemysław Jasielski’s art. Translated from the Polish by Marcin Łakomski. Exhibition opening: May 17, 2019, 6 p.m.